Get a head start on your career in space exploration with MESA’s Summer Academy! Students will plan and build remote robots, fly rockets, and learn to code with Sphero robots, while cementing broader concepts from across the math, science, and technology curriculums. The two-week camp will also include field trips and meetings with scientists and space professionals. Each student will participate in collaborative and independent research, and a design-and-build task, all under the guidance of Temple University faculty and counsellors. As a camp, we will form questions, research answers, and discuss what we learn: inquiry learning is a fun and scientifically-sound way to explore this topic, as we share knowledge as a community and work together to explore the science of space. Eligibility: This program is for students Currently in Grades 5 through 8. When: The program will take place between July 9 and 20, from 9am until 4pm, on Temple University’s Main Campus. Student can be dropped off after 8:30am and must be picked up by 5pm. Extended care will be offered as follows: 8:00 AM to 8:30 AM = $25/week and 5:00 PM to 6:00 PM = $50/week. Cost:The program fee is $595. Lunches, program t-shirts, and course materials are included. Scholarship and Discounts: Apply before May 1 for an early bird discount of $50. There is a 10% discount for siblings, and for children of Temple University employees, alumni, and students. Limited scholarships are available based on financial need and North Philadelphia residency (located in north of City Hall in Philadelphia). Deadlines and Decisions: The application deadline is June 1. Early bird discount ($50) deadline is May 1. Application will be considered as they are received and applicants will be notified within 2 weeks after the application deadline. Decisions will be based on applicant's essay, teacher's recommendation, and latest school report card (if submitted). To see the official flyer for this program, please click here. In addition, the program will include field trips to science institutes/museums to further enhance the program’s engagement with hands-on scientific exploration (locations to be confirmed). Students will complete a short series of questions at the beginning and end of the program, designed to assess the knowledge gained over the course of the program. 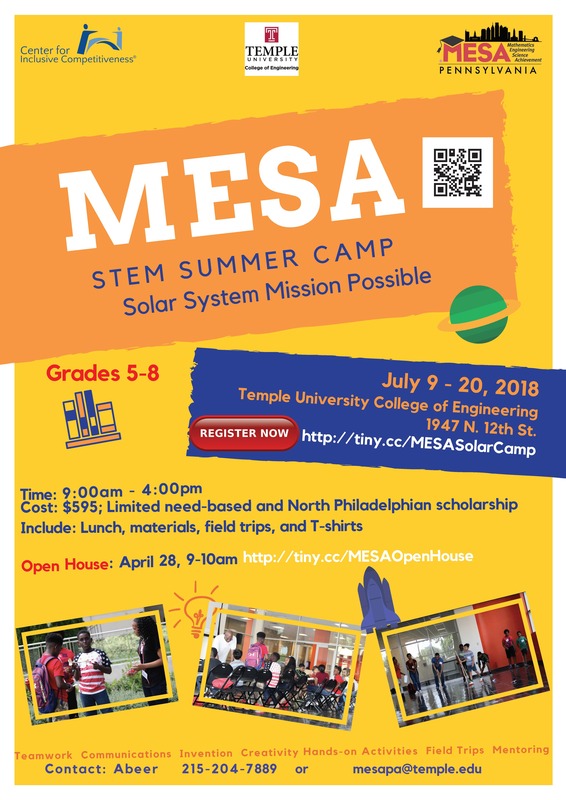 Throughout the two-week program, students will work on projects under the direct supervision of Temple University faculty, who will provide guidance and assessment, and who will ensure that each student is challenged and has the tools for success in meeting those challenges. Differentiated instruction is a fundamental part of the camp’s approach to student learning: all elements of the program will include multiple entry and exit points, as well as hands-on activities based around high-interest topics, to ensure the inclusion and success of every student and their individual learning style. *** NOTE: If you are a parent creating an account in order to apply for your child, please use the child's information (name, DOB, etc.) in the account creation process, not your own. Thank you.